Have you ever dreamed of launching your own business? One of the biggest hurdles to taking that leap is feeling like you’re too old to get started. The arguments are always the same: you don’t have enough time, you don’t have the energy of a 20 year old, or you don’t feel like you know what it would take to run a website. 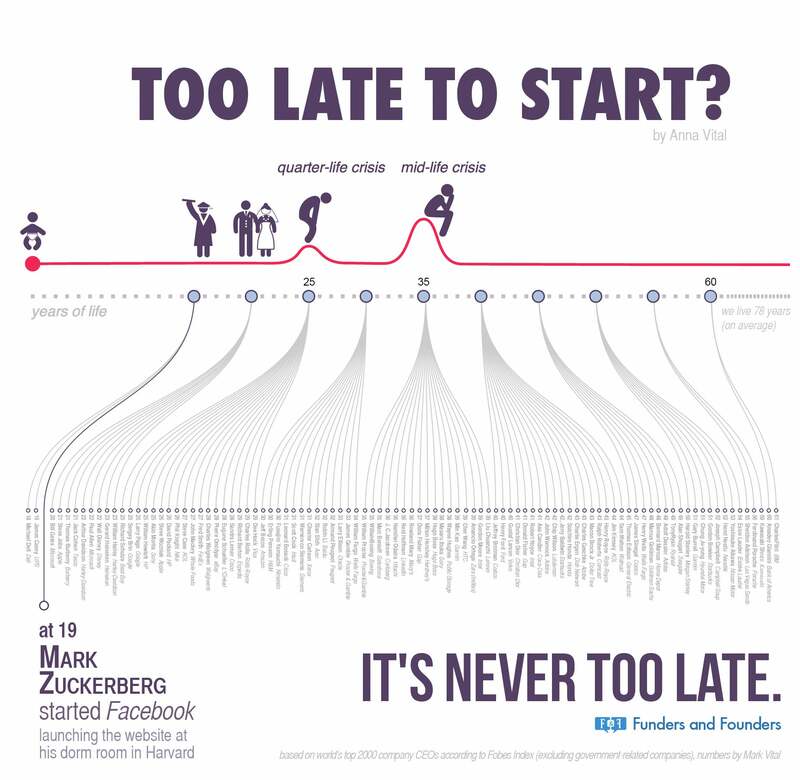 Consider this: while people like Mark Zuckerberg may have started Facebook at 19, there are just as many entrepreneurs out there who didn’t get started until much later in life. For example, Reid Hoffman, founder of LinkedIn, was 36 when he got started with his venture! Chip Wilson, who created the yoga attire/workout clothing supergiant Lululemon, was 43 when he began. Jerry Baldwin (pictured to the right) is the founder of Starbucks. How old was he when he began? 42! Success simply starts from a good idea, and having the desire to follow through on that idea. While starting older may give you less energy to pull all nighters for the sake of your business, you do have one specific advantage over your younger rivals: experience. In fact, starting later in age may be a better idea, because you’ve been around longer to see how businesses are run. Want some more inspiration? Check out this huge infographic from Entrepreneur that lists famous people and how old they were when they started successful companies. You’ll be surprised to see how many familiar names didn’t get started until their 30’s or later! Click the image to enlarge. Have you been sufficiently inspired to jump into the exciting world of entrepreneurship? If you’ve started your own small business and want to see more results with your website (or if you don’t have a website at all), get in touch with us today. We can help bring more traffic and conversions so you can continue to grow!